Ford F-Series Pickups are the best-selling vehicles in America, with more than half a million sold every year. Their enduring popularity is due to their unmatched combination of amazing versatility and excellent value. "Its a fascinating hands-on ride, full of great detail drawn from the authors dual experience as mechanic and automotive journalist. 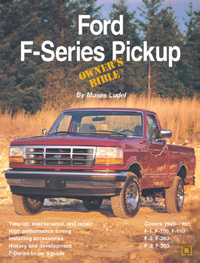 Ludel lets you get the most out of your F-Series-whether the aim is restoring a vintage model or simply keeping a current truck up to snuff ...."
Author Moses Ludel has written the authoritative companion book for your F-Series pickup. His tips and suggestions cover the full range of F-Series duties and help you get the most from your pickup, whether it's a farm workhorse, weekend trailer puller, 4x4 trail crawler, rolling office, or daily driver. High performance modifications, accessories to tailor your Ford to your individual driving demands, F-Series development history, and tips you should know when buying a new or used F-Series are just a few of the many topics covered. Many F-Series owners take pride in maintaining and servicing their pickups themselves. To help the "do-it-yourselfer," Moses provides step-by-step instruction backed up with hundreds of photographs that cover procedures from oil changes and basic tune-ups to more complicated engine, transmission, suspension and electrical repairs. With his experienced, hands-on guidance, Moses makes it easy for you to keep your F-Series operating at peak condition. For the best high-performance tuning information, Moses went straight to the experts-Ford Motorsport. He worked directly with Ford's Special Vehicle Operations engineers to give you the "hot set-up" for your pickup from cams to camber adjustment. If you want to know how to buy, drive, maintain, or modify your truck, Ford F-Series Pickup Owner's Bible will show you the way.